The Yuma Union High School District was a joint financial partner with the City of Yuma for the programming and construction of The Valley Aquatic Center. The facility is located on school district property adjacent to Cibola High School. The competitive pool is used for community and high school competitive programs in swimming, diving and waterpolo. The local valley area Arizona and USA swimming organizations utilize the pool for training and competitive meets. 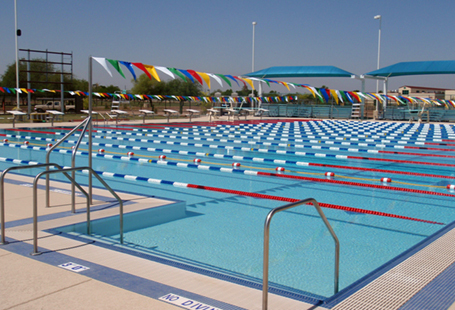 The City of Yuma operate the facility and manage instructional and recreation programming in both pools. There is large support and interest in the recreational and instructional programs throughout the extended Arizona summer months from both the local valley community and the many tourists that visit Yuma’s nearby Colorado/Gila river valley, Imperial National Wildlife Refuge and the many historical and prehistoric sites. The Valley Aquatic Center, an outdoor mini-waterpark, is located just northwest of the Cibola High School campus. State-of-the-art features include an 8,400 sq. ft. 13 lane competition pool with 1- and 3-meter diving boards, starting blocks, and covered bleacher seating. A 380 sq. ft. splash pad provides little guests zip-around fun with spraying water features. A 6,000 sq. ft. zero-depth entry leisure pool provides a participatory play feature where children can climb on, crawl through, and slide down the water playground. A large waterslide offers plunging into the pool entertainment while dumping buckets topple onto guests waiting below. Other features include geysers, shaded picnic areas, and a bathhouse with family changing areas.